If anyone out there is reading this blog but happens not to follow me on Twitter, first off, let me tell you you’re missing some gems. But you will hopefully also be pleased to learn that due to an unexpectedly quick and overwhelmingly positive response to my last post, The Cable Bible has passed from a half-rhymed idea to a concrete project in record time. The bare bones of it are in place on the AMIA Open Source Committee’s Github page, and I will be trying to expand on it throughout the summer, adding more interface and protocol descriptions, images of connectors and pinouts, etc. If it’s a project you’re interested in, please contribute! Moving the guide from my own private Google doc to a Github repository was intended to encourage collaboration (I can’t catalog every single computer cable myself, dig?) – and if using Github overwhelms you (it IS intended mainly for software developers, and using it for documentation has its advantages but also non-intuitive kinks), may I direct you to Ashley Blewer’s terrific introduction to the interface? But before The Cable Bible becomes a one-stop shop for all this information, I’ve already started to field a couple questions about cabling based on what I’ve learned over the past month or so. And one of the main ones, which I’d like to talk briefly about today, is the question of balanced versus unbalanced audio cables, and what the hell that means. Balanced and unbalanced audio were terms that came up occasionally during my coursework at NYU, primarily in relation to setting up workflows for digitization of media on magnetic tape. 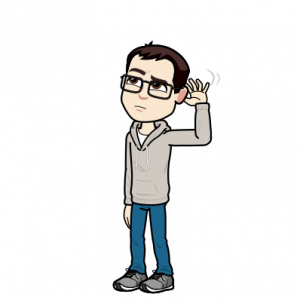 But unlike, say, the difference between composite and component video signals, the difference between balanced and unbalanced audio was never really satisfactorily explained to us. That’s sometimes how it is when you attend a Moving Image Archiving program – due to to the constraints of time in an already over-crowded curriculum, some aspects of audio preservation can get short shrift, as if audio is a necessary evil in our quest to appease our visual appetites (we fully recognize this is something to improve in our program and the field at large – recently the Library of Congress hosted a conference regarding the work of its Radio Preservation Task Force, and the 10th Orphan Film Symposium in April celebrated how the history of film and the moving image is intertwined with the history of sound recording). But understanding balanced and unbalanced audio is a relatively simple concept, as it turns out, and worth understanding because from the outside the binary nature of the terms is slightly misleading, implying “good” and “bad” audio cables, when really employing either is perfectly acceptable given the right context. Audio cables in general are susceptible to “noise.” No duh, right. But I’m not talking about noise in the general sense of “sound.” In audio cabling (whether a production, playback or preservation environment), “noise” usually refers to unwanted interference with the audio signal as it passes along a cable: an audible hum introduced by other electronic equipment or lights in the vicinity, minuscule snatches of radio and television transmissions in the air, etc. Unbalanced cables actually contain two wires inside of them (and connectors that have two corresponding conductors each). One wire carries the audio signal, while the other is referred to as “ground” (and typically surrounds the audio signal wire in the center of the cable). The primary purpose of the ground wire is to shield the signal wire from outside interference, and in many cases it does a fine job of noise reduction. However, at other times, the ground wire can itself act as an antenna and start picking up unwanted noise itself. Typically the longer the cable, the more susceptible an unbalanced cable will be to noise. Balanced cables were introduced as a method of increased noise reduction. Instead of two wires, balanced audio cables contain three wires: ground, “hot” (the desired audio signal) and “cold” (a “negative” copy of the signal). The signal on the “cold” wire is exactly 180° out of phase of the audio signal – meaning if you were to play these two signals at the same time, they would theoretically cancel each other out, leaving you with silence. On the right, a “cold” signal with positive and negative peaks exactly the opposite of the original. That seems undesirable. But what equipment designed for a balanced signal does is flip the signal on the “cold” wire back into phase at the point of input. This has two advantages: first, you’ve now theoretically doubled the strength of your audio signal, as the signals from the two wires will be perfectly the same at playback. But also keep in mind that any noise that was picked up as the signal traveled along the cable will be the same on both wires (not 180° out of phase with itself). So when the “cold” wire signal is inverted at input, the noise will now be phased out when combined with the noise signal from the “hot” wire. You’ve cancelled out the noise when the audio is played back. Certain types of connectors make it easy to spot a balanced or unbalanced cable. XLR connectors are most common for balanced signals (you can easily see the three pins in an XLR connection, acting as the conductors for the ground, hot and cold wires), while RCA connectors will always carry an unbalanced signal, as they only have two conductors (the main pin conducts the audio signal, while the outer, round shield of an RCA connector is the contact point for the ground wire). 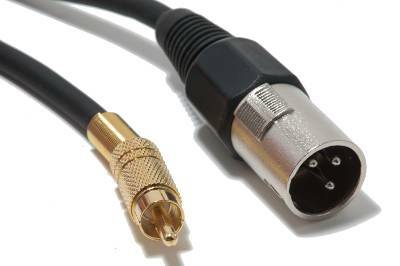 1/4″ and 1/8″ jacks, however, come in different flavors (TS “tip-sleeve” or TRS “tip-ring-sleeve”), and are also frequently used to carry stereo signals (all the discussion above relates to mono signals, where one cable is designed to convey one channel of audio; stereo cables can carry two channels of audio, which adds another wrinkle to the balanced/unbalanced issue). So you have to watch out with 1/4″ and 1/8″ jack inputs and cables, to be sure you’re conveying the signal you want. (There is no harm per se to using a balanced audio cable with equipment designed to use an unbalanced audio signal, or vice versa; the sound will travel from point A to point B either way, but you won’t get the noise reduction benefit of balanced cables used with balanced equipment). Balanced cables are usually associated with professional setups, while unbalanced audio is frequently found with consumer-grade equipment – DVD and CD players, for example. But really, using either is just matter of how much you’re concerned about noise interference. For instance, in our digital audio workstation in the department, our former cassette deck (bereft of life, it rests in peace) only had RCA, unbalanced audio output. That might seem unideal for an archival digitization workflow, but given our setup the audio cable was barely traveling a foot to a patch bay; plus both the cassette deck and Wavelab software we were using for capture had built-in noise reduction capabilities. If we were more concerned with preserving the quality of these cassette recordings over the content, I might be concerned about using these features, but given at least that specific collection and this specific equipment, noise was not particularly considered an issue and unbalanced signal was perfectly acceptable. 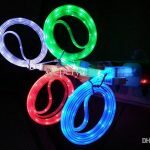 For more lessons in audio cabling, keep an eye peeled on The Cable Bible – and maybe someday we’ll talk about optical cables, which is a whole different, flashy Tron-like ballgame.